Do you long to connect deeply with your children? To have a significant, positive impact on their lives? To celebrate their successes and discoveries as well as ordinary moments spent together? If this is what you want, but you find the distractions of daily life getting in the way, then this book is for you. 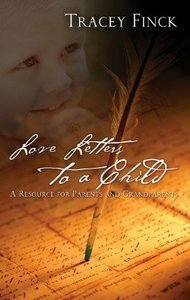 Writing a love letter to your child takes less than 10 minutes and is an easy and effective way to Affirm your child's uniqueness as a creation of God Bond with your child Celebrate and encourage character growth Document milestones in your child's spiritual journey Establish a family legacy This book will make you laugh and cry as you are given a look into the very personal letters the author has kept in journals for each of her children. Here you'll find everything you need to start recording evidence of a childhood properly enjoyed, of life fully embraced, and of a relationship strongly rooted. About "Love Letters to a Child"
Tracey Finck is a speaker, writer, and editor. Her business, called Communications Cafe, is based in Princeton, Minnesota, where she lives with her husband and three children. She has taught at Bethel University, St. Paul, and North Central University, Minneapolis, and was a parenting advice columnist for the Brainerd [ Minnesota ] Daily Dispatch. She currently teaches for the University of Phoenix. Tracey holds a M.A. in English education from the University of Minnesota and a B.A. from St. Olaf College, Northfield, Minnesota .